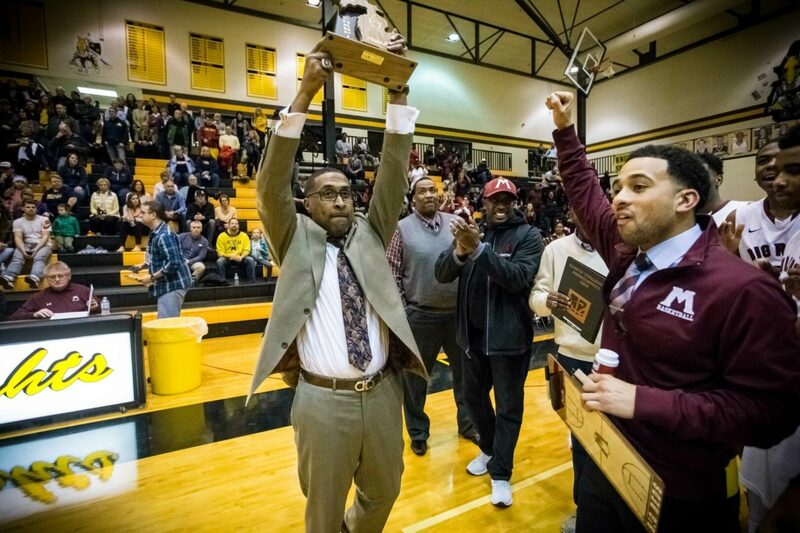 MUSKEGON – District championships are only the first step on the path to state high school basketball titles, but coaches still love to win them. It means their team is at least the best in its neck of the woods, and there’s something to be said for that. Some coaches never win a district title. Some win quite a few, if they stick around long enough and maintain good programs. 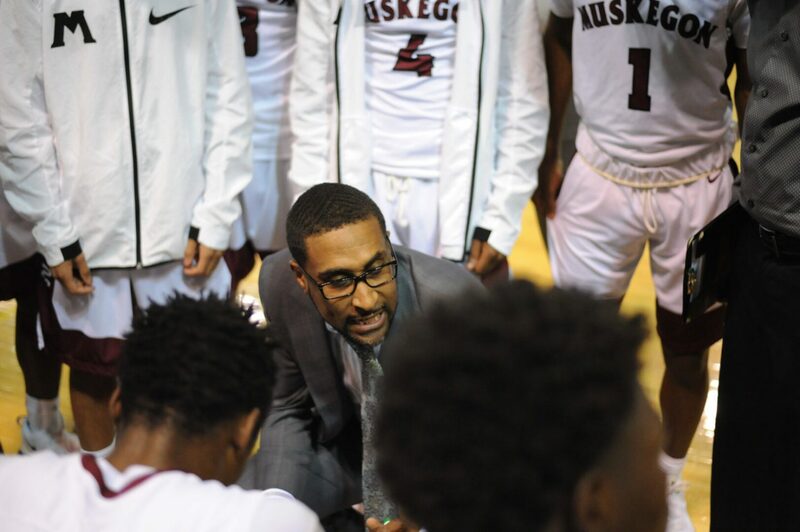 But Muskegon’s Keith Guy might be in a class of his own in that category, because his teams have won district championships every year of his long varsity career. That’s right – every single year. Guy’s Muskegon boys basketball team beat Reeths-Puffer 64-54 on Friday to capture its seventh straight district championship. That means Guy has won districts every year he’s been at Muskegon. But his streak goes back a lot further than that. Guy previously coached at Muskegon Heights, where his Tigers won nine straight district titles, between 2004 and 2012. That means Guy’s teams have hoisted a district championship trophy every year for the past 16. If that’s not a state record, it has to be close. Of course winning districts means a ticket to regionals, which will begin on Tuesday for the Big Reds, when they meet East Kentwood at Holland West Ottawa High School at 6 p.m. The winner will advance to Thursday’s regional title game. But before all of that starts, it’s well worth noting Guy’s incredible streak in districts. “I have no idea, to be honest,” said Guy, when asked if any other coach he’s heard of has ever won 16 straight district titles. “I guess I’ve just been blessed and fortunate. Guy grew up in Muskegon Heights and played basketball at his hometown high school under legendary coach Lee Gilbert, who won two state titles during a long career. He has always made it clear that his primary goal is to win state championships, and his teams have frequently made impressive runs. His Big Reds pulled it off in 2013-14, posting an undefeated record and cruising to the Class A state title. His 2012-13 and 2015-16 Muskegon squads made it to the state quarterfinals. At Muskegon Heights, Guys’ Tigers advanced to the Class B state finals in 2005 and 2011. But state titles aside, Guy has a strong appreciation of what it means to win districts and be the best in the area, year after year. It’s evidence that an elite program remains in good shape, with no big drop-off in performance. That’s hard to maintain, with different groups of players coming and going every year, and local rivals all gunning for you every season, according to Guy. 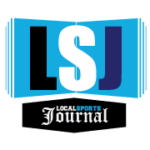 Guy says one of the compelling parts of his job is taking a new group of players every year and molding them into a team that can keep the district title streak going – and perhaps go a lot farther. One key to success, according to Guy, is putting in a lot of long hours. “It’s a lot harder than people think,” he said. “We don’t just roll the balls out. It takes a lot of hard work by the kids, and a lot of work by the assistant coaches with skill development. It doesn’t just happen. While the Big Red players are clearly focused on their next challenge in regionals, Guy said they were more than excited to win that district trophy on Friday.